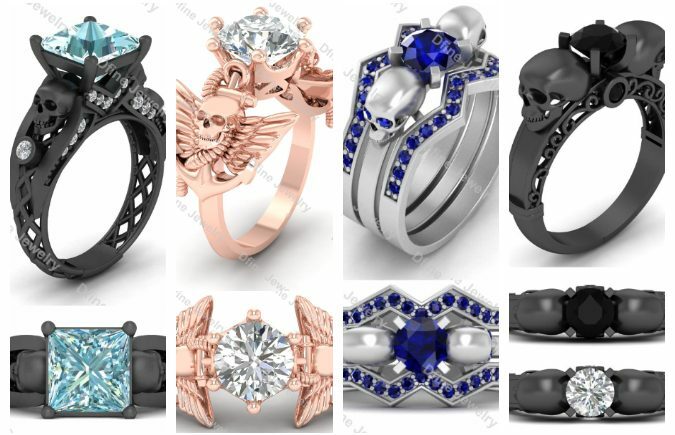 A skull is one of the most powerful and oldest symbol to mankind, And that is the reason why it is not surprising that skull jewelry has evolved in to a popular fashion trend. The reality is that people wear skull ring for completely different reasons. While some believe that wearing ring with skulls may help them obtain good luck and fortune, Other associate the skull with deeper meanings. I have written full article on why people wear skull jewelry check it out. Since there are many underlying meaning related to the skull, the fashion industry has emerged the trend whole heartedly. 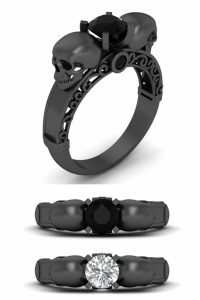 And if you do not need to associated with symbolism, skull rings look insanely cool. They represents freedom, individuality and the fact that you don’t adhere with the rules set by the society. Many people who wear skull jewelry drawn to the fashion appeal of the products. Some men and women even purchase designer skull rings with gold, silver, gemstones or diamonds to flaunt their expensive taste. This skull engagement ring has two big skulls besides of one black diamond at the centre. Ring is available in all precious metals like 925 sterling silver, 10kt, 14kt, 18kt solid gold. You can select one of the color from black, white, gold and rose gold. The approximate weight of the ring is 7 gm (Actual Weight of The Ring May Vary With Size) and the dimension of the diamond is 5.6 mm. The price of the ring is from 120$ to 700$. 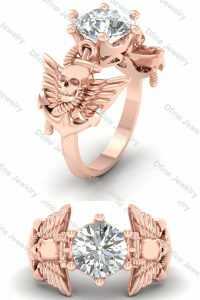 This Archangel Wings Gothic Ring Made With Round Cut 6 Prong Set Nearly White Moissanite With Rose Gold Rhodium Finish 925 Sterling Silver and Solid 10k, 14k, 18k Rose Gold. The crown type design on setting makes it look more beautiful. The average weight of the ring is 8.5 gm (Actual Weight of The Ring May Vary With Size). The dimension of the moissanite is 8.30mm. The price of the ring is from 399.99$ to 939.99$. Two skulls on middle band with diamond in the eyes. The middle band has solitaire of approximate 0.65ct carat weight. Two bands with diamonds makes it look so gorgeous. You can wear it with supportive bands or without it. The main diamond is approx 0.65 carat weight and dimension is 5.4. Carat weight of the diamonds on the bands are approxly 0.38ct. You can choose the metal from silver to gold depends on your budget. You can replace natural diamonds with lab created. 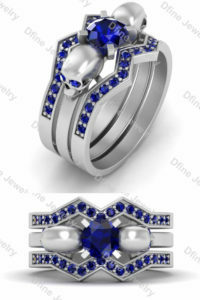 This beautiful skull wedding ring set prices from 184.99$ to 799.99$. This gorgeous ring has everything one can ask for skull engagement rings. 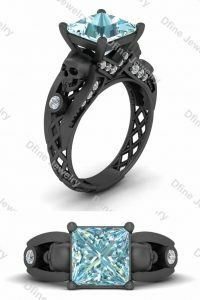 It has two skulls, solitaire, accents and shank design. The criss cross type design on shank of the ring makes it unique and beautiful. You can go with any metal color for this ring like white, yellow, rose, black. And to make affordable you can go solid 925 sterling silver with lab created diamonds or moissanite. This gorgeous ring ranges from 279.99$ to 679.99$. 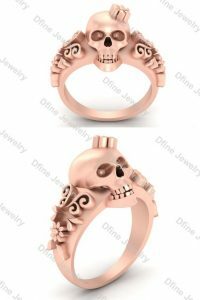 This rose art deco skull rose gold ring is perfect for the women. It has beautiful flower touch on shank with one well crafted skull. The flower on the forehead of the skull is simply amazing for the ring. The ring is available in many metals like 925 sterling silver, 10kt gold, 14kt gold, 18kt gold. The various colors are also available for this ring like white, black, rose gold, yellow gold. The average weight of the ring is 13 gm (Actual Weight of The Band May Vary With Size). And the price of the ring is from 194.99$ to 789.99$. These all five rings are best for the women on the occasions like engagement and wedding. The best parts of all these rings are they are available in many metals and many colors, you can choose the best whichever suits you. What are your thoughts on this collection? Comment below.